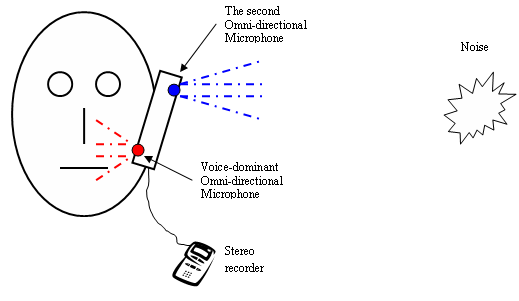 Two omni-directional microphones are needed to record sound. These two microphones need to be separated with distance roughly the size of regular handset. Like regular handset, one microphone is close to mouth to record mainly voice, and another picks up both voice and noise. When recording, there should be one or more noise sources at least several meters away from the handset, and one speaker holding the handset to speak. The two microphone's sounds should be recorded into a two-channel stereo (L holds voice-dominant microphone sound and R holds the second microphone sound) wav file with 16000Hz sampling rate and 16bits/sample linear PCM format. Attached includes some examples we recorded indoor, outdoor or in other environment covering different SNR. The following is a typical setting for the recording.